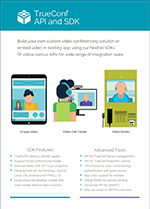 Many of TrueConf’s functions are available in the form of various video conferencing SDKs and APIs. 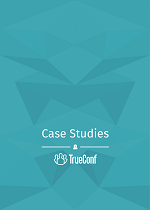 With many years’ experience of video conferencing development behind us, we are happy to share TrueConf’s best solutions with our users and customers. Bring to life your most daring collaboration ideas with the help of our development kits! All applications based on this SDK can be integrated into your video conferencing infrastructure. TrueConf Server software or private cloud containing several TrueConf Servers can be used as video conferencing server. The number of users supported by your infrastructure is not limited. If you wish to integrate audio and video calls into an existing mobile application, our SDK is exactly what you need. Our solution has no superfluous features: it’s pure functionality with a simple user-friendly interface. You can create a mobile application supporting HD video conferencing and distribute it in any way convenient for you within a day. TrueConf SDK will take care of everything: network, drivers, and the video conferencing itself. All client application features, including chat, audio, video, group video conferences, content transmission and receiving. Support for third-party user’s management and presence status control solutions, e.g. video call centers. Application runs in the background: no need to run the app to be online. TrueConf SDKs have been tested in the multi-million audience projects and distributed as a library for Android Studio and xCode IDE’s. The TrueConf Terminal API was designed to add video conferencing capabilities virtually into any hardware or software solution which speaks HTTP. We are offering a special application for PC which runs in full screen mode, has no interface and just listens to your commands over the network to create conferences, invite participants, switch layouts, select audio/video devices and change users. It is a great solution for video conferencing-enabled kiosks and other vertical appliances. Operating via TrueConf Server dedicated server or TrueConf Online cloud service. Control devices that capture and output video, audio and content, including PTZ cameras. Access to the users statuses, search operators available. OS: Windows, Linux (under development), MacOSX (on request). Server API enables users to control TrueConf Server remotely with the help of simple RESTful HTTP(s) requests. Server API is available for any versions of TrueConf Server for free. Users and address book management. Conferencing scheduling, launch and termination. Invitations and in-conference participant management. For example: use the Slack™ add-on that creates a conference on TrueConf Server and automatically invites all existing channel participants into the conference via the /trueconf command. This is used to start the TrueConf desktop or mobile application to join a video conference or make a video call by following a link from another application or web site. Make calls by ID or join conferences by CID. Authorize as an existing user or as a guest. Open chat windows with selected user. Those who do not have the application yet are redirected to Google Play or App Store. For example: the “Join a Meeting” button in a company’s calendar software which authenticates users based on their Active Directory entry and connects him or her to a meeting. Start the second copy of the app to capture video from multiple sources. Switch the app to a full screen or terminal modes on the start-up. Room mode: keep the app in full screen mode between calls. Allows you to add video conferencing capabilities onto your web site. Your visitors or guests do not need to install any software or create accounts to join a conference using this plugin-free approach. Up to 100 WebRTC participants in a single conference (up to 250 in total). Automatic callback to a downloadable single use client app for browsers which don’t support WebRTC. HTML5 widget pre-configured to join users and guests to a specific conference. You can moderate WebRTC conferences using any desktop or mobile TrueConf app. To learn more, feel free to contact us!